ISRO's Integral Diaphragm Pressure Transducers (IDPT) of range 0-30Bar & 0-300Bar are used for pressure monitoring in spacecraft chemical propulsion systems for GEOSAT, IRNSS, IRS, and interplanetary missions like MOM & Chandraayan. The sensor is a basic strain gauge type bonded connected in four arms active wheat stone bridge configuration on integral diaphragm and the transducer is compensated for the temperature range of –7°C to +65°C. 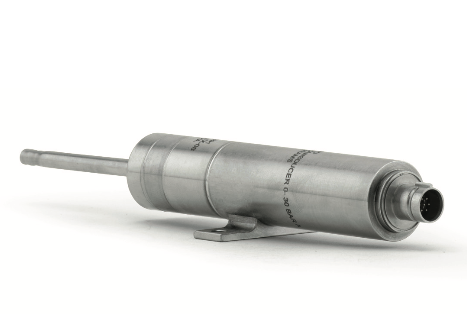 The pressure transducer has built in electronics for signal conditioning and for obtaining a full-scale output of +5V ±0.25V at 30 bar & 300 Bar and –5V ±0.25V at zero absolute pressure. The output signal is proportional to the input pressure. It has proved its all expectancy of more than 15 years in satellite missions. It has performed successfully during deep space mission like MOM (Mars Orbit Mission) & Chandrayaan-1. This sensor performed well in all spacecraft that it has flown on, like IRS, INSAT, IRNSS & GEOSAT, etc.